Dennis Olsen, the Porsche junior driver of Konrad Motorsport, is the winner of the Porsche Carrera Cup Germany Race 2 at Norisring. Unlike in the opening race of the weekend, Dennis Olsen was able to defend his lead while his teammate Thomas Preining took the 2nd place from the Saturday’s race winner Nick Yelloly for a while but the British driver relatively soon gained back P2. However, during 35 laps Olsen’s lead never was really challenged and Norwegian scored his fifth win of the season, finishing 4.5s ahead of Yelloly and 8.4s ahead of Preining. 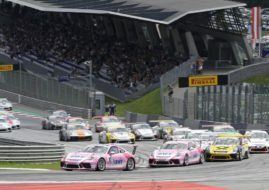 The fifth round of the Porsche Carrera Cup Germany will go on July 15-16 at Nurburgring Grand Prix Circuit.